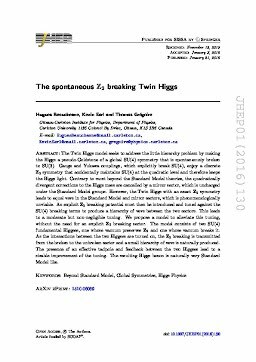 Abstract: The Twin Higgs model seeks to address the little hierarchy problem by making the Higgs a pseudo-Goldstone of a global SU(4) symmetry that is spontaneously broken to SU(3). Gauge and Yukawa couplings, which explicitly break SU(4), enjoy a discrete ℤ2 symmetry that accidentally maintains SU(4) at the quadratic level and therefore keeps the Higgs light. Contrary to most beyond the Standard Model theories, the quadratically divergent corrections to the Higgs mass are cancelled by a mirror sector, which is uncharged under the Standard Model groups. However, the Twin Higgs with an exact ℤ2 symmetry leads to equal vevs in the Standard Model and mirror sectors, which is phenomenologically unviable. An explicit ℤ2 breaking potential must then be introduced and tuned against the SU(4) breaking terms to produce a hierarchy of vevs between the two sectors. This leads to a moderate but non-negligible tuning. We propose a model to alleviate this tuning, without the need for an explicit ℤ2 breaking sector. The model consists of two SU(4) fundamental Higgses, one whose vacuum preserves ℤ2 and one whose vacuum breaks it. As the interactions between the two Higgses are turned on, the ℤ2 breaking is transmitted from the broken to the unbroken sector and a small hierarchy of vevs is naturally produced. The presence of an effective tadpole and feedback between the two Higgses lead to a sizable improvement of the tuning. The resulting Higgs boson is naturally very Standard Model like.